Jelly beans, chocolate eggs, marshmallows…the stores are filled with a variety of Easter treats. Have you started shopping for Easter yet? I did…but then I started snacking on it all. Oops. Oh well, I still have time to fit in a second round of Easter shopping before the end of the month. Next time I’ll have to try to hide the treats from myself. Ha! Does that actually work for anyone? Hiding treats from yourself? Like could you really forget that there was a big box of chocolates “hiding” up in your pantry? I can’t. Guess it’s time to work on my willpower. This Easter Bunny Bait snack mix certainly was a test for my willpower! 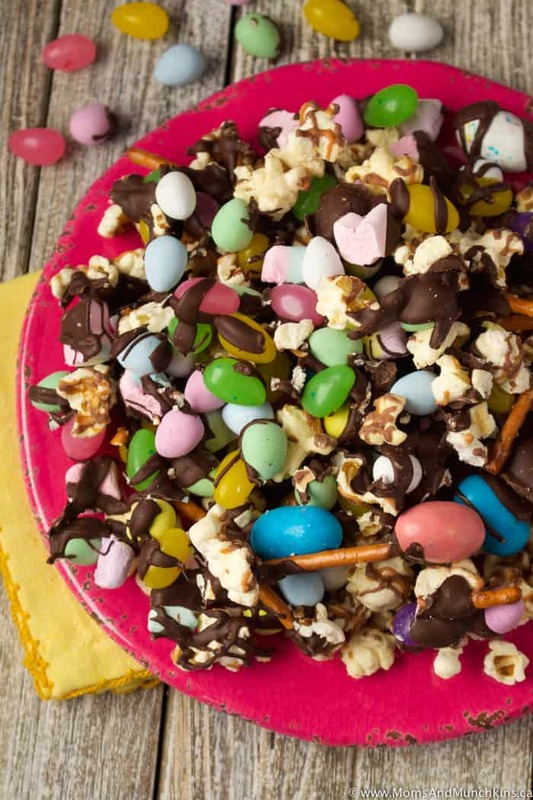 It’s a delicious combination of sweet popcorn, Easter candies, pretzels and chocolate. 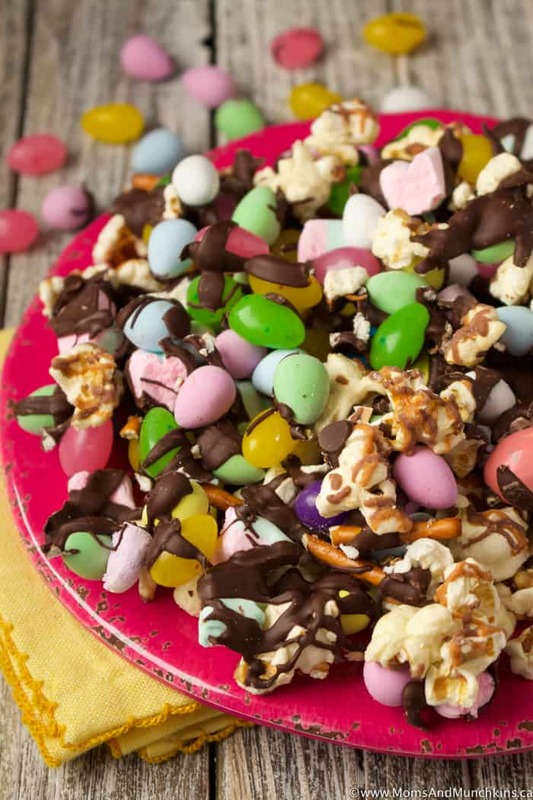 Like a sweet & salty snack mix but with an Easter twist. It would make a great movie night snack mix. I don’t include quantities in the recipe because you just add in as much as you want of each item. For the popcorn, you could go with regular plain popcorn but I prefer a caramel and chocolate mixture. For this recipe, I used the Smartfood brand – Milk Chocolate and Caramel Drizzle. Even just plain caramel popcorn here will work since you’ll be pouring chocolate over all of it later anyways. Put all ingredients (except melted chocolate) on a wax paper lined cookie sheet. Spread all the ingredients out in a thin, single layer. Drizzle melted chocolate over top. Put in freezer to allow chocolate to harden (about 30-60 minutes) then remove from freezer, break into pieces and store in a food storage resealable bag. 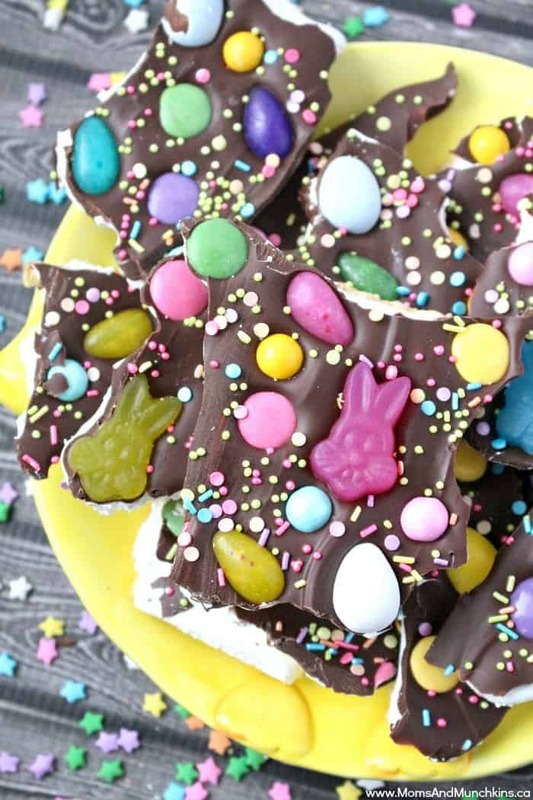 Easter Bunny Bark – kinda like a s’mores with a graham cracker base, marshmallow middle and chocolate topped with Easter candies. 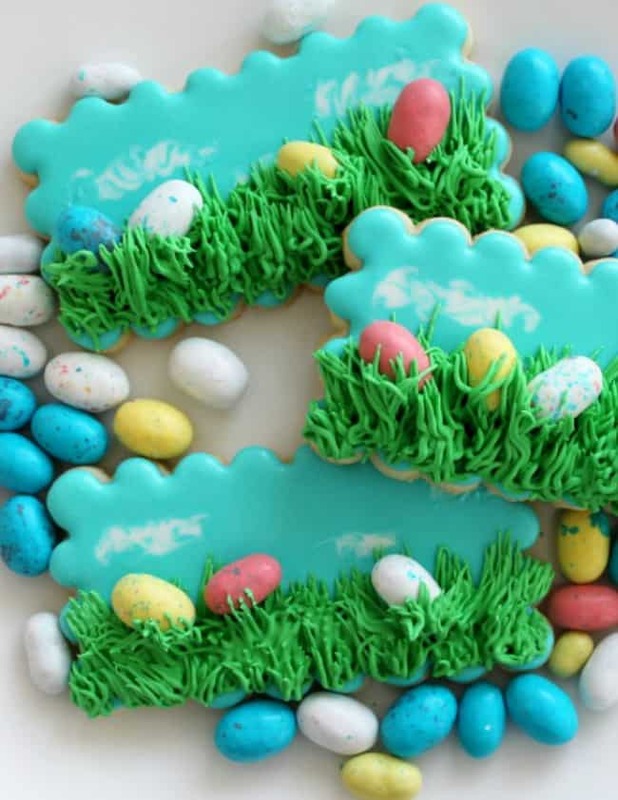 Easter Egg Hunt Cookies – a cute cookie decorating tutorial for your Easter celebrations. Visit our Easter page for even more recipes, free printables, party ideas and more! We’re always adding new recipes and creative ideas for home entertaining. Stay updated on the latest by following us on Facebook, Twitter, Pinterest and Instagram.